USA Mortgage is a full service mortgage bank. This means that USA Mortgage will see you through all aspects of the loan process from the time you meet one of our mortgage professionals to the day you sit at the closing table, and ultimately fund your loan with its own money—no waiting for the corporate bigwigs halfway across the country to cut your check! To borrowers and Realtors©, being a mortgage bank means you can expect a home financing experience free of hassles and headaches. The complete control means having in-house operations such as processing, underwriting, closing, and funding. 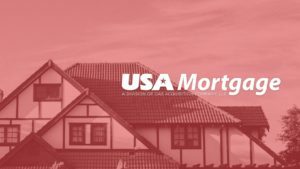 Here at USA Mortgage, we follow a very organized and stable system to achieve the best results for you. We have created a routine on every file to be very efficient and accurate for your benefit. As our underwriters are reviewing the files, they may require additional information. The housing market is changing quickly, and this will add more guidelines and new documents to our lending department. We will be in touch with you regarding these conditions required. The goal is to get these back to the underwriting ASAP.